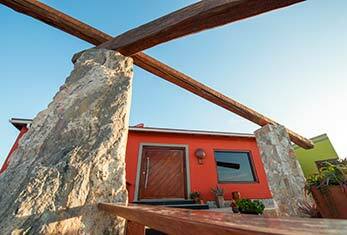 A short drive from central Swakopmund ( 3.2 km ), its spectacular location provides peace and tranquillity away from the bustling town, and the privilege of savouring the ancient Namib Deser. In it’s prime position above the ephemeral Swakop River overlooking a vast and sensuous apricot dune sea, Desert Breeze offers the ultimate desert experience. 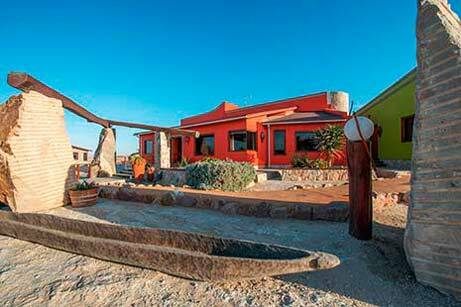 A short drive from central Swakopmund, its spectacular location provides peace and tranquillity away from the bustling town, and the privilege of savouring the ancient Namib Desert. 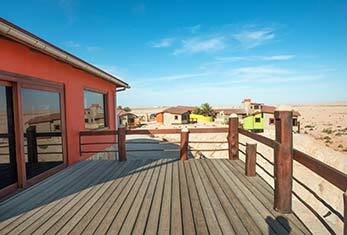 Desert Breeze offers 12 en-suite, luxury bungalows and one exquisite three-roomed villa, each with a private balcony from where to admire the breath-taking view of the dunes. 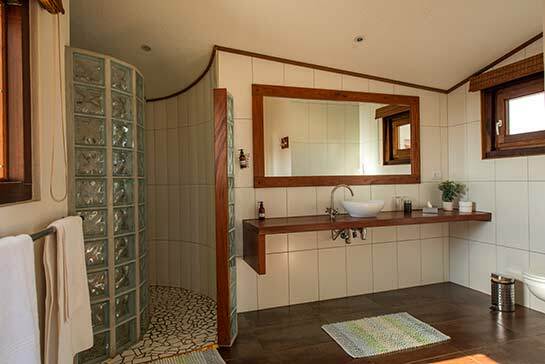 Each bungalow and the villa are equipped with wireless internet, mini bar, a fireplace and coffee and tea making facilities as well as digital safes. New addition is our “Jungle Bungalow” two rooms with lounge fire place and deck. Wheel chair friendly situated in the garden. No dune view from the bungalow but can enjoy the view from the breakfast room. The breakfast facility, with it’s breathtaking view, serves only the freshest of produce. Seating is available indoors or on the deck for guests to enjoy the peaceful atmosphere. Secure parking as well as laundry facilities are available. Amazing! 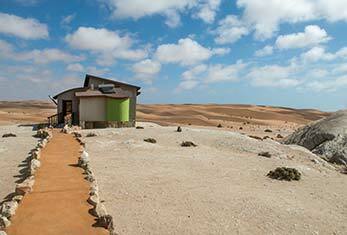 Very special and tranquil place overlooking the wonderful Namib desert dunes. 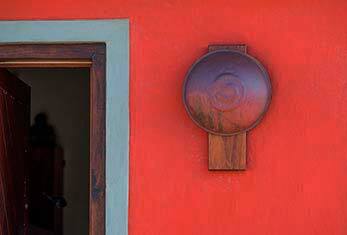 The rooms/chalets are extraordinary: extremely beautiful, comfortable and spacious. Lots of attention to detail. And the panoramic views and the scenery... just stunning, almost surreal! It's on the edge of town but still pretty close to the city centre (5 minutes by car). Excellent breakfast and friendly staff. A slice of heaven. We were lucky to have secured a last minute booking at the Desert Breeze and were we in for a surprise! You have golden dunes to wake up to, camels grazing down below in the river bed, bird life, locals going for long walks etc etc! The staff were amazing, really helpful. The welcome and food at breakfast was great! Also thanks to Danie (the Owner) for tons of advice for our next trip to Namibia! We will definitely be back at the Desert Breeze! Great setting. We weren't sure what to expect as we drove away from the town centre to this lodge. Driving through the gates revealed an intriguing building with interesting grounds. But it was only when we walked to our "room" - along a path and then across a bridge - that we appreciated the setting above the river bed and opposite the dunes. The big windows and well positioned bed made the most of this view. Gorgeous. Plenty of space with a sitting room and large bathroom and also very comfortable and great facilities too. A good breakfast was served in the main lodge also with the same fantastic view. There is also a way to walk down, across the river bed to have your sundowner on the dune. While a bit out of town, driving in for meals was not a problem and it was a great place to spend a couple of nights. Very friendly and helpful staff too. What a view! Wow, when we walked into our little "home" for 2 nights we could not stop looking at the view outside of the ever changing dunes, just beautiful. Staff friendly and excellent breakfasts, which are served in the main lodge, no other meals served here but there are plenty of dining options within a few minutes drive. Huge room with separate seating area - comfy couch and wood fire if needed, decent sized fridge and kettle - tea & coffee etc. 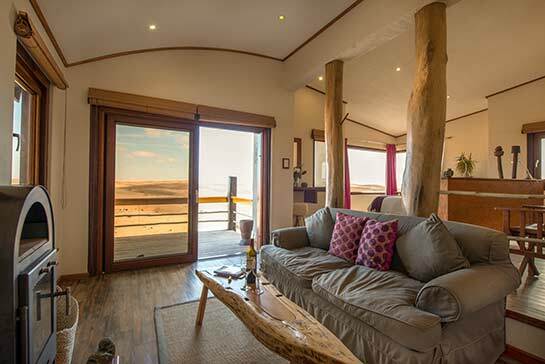 The views from the bed or couch towards the dunes are amazing - who needs a tv! Large bathroom with great shower. Wifi worked fine in our room. Would definitely recommend. 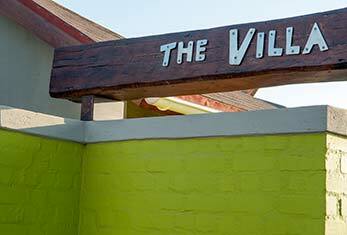 Do stay here when you're in Swakopmund. I loved this lodge. The view of the desert is spectacular. There are some times when the mist will obscure your view (early morning and late evening), but it comes and goes. It can also be windy. However, everything is set up for you to enjoy the view if you stay inside. Wifi and a hearty breakfast are included. BRILLIANT , RELAXED AND A REAL TREAT. Our visit was unscheduled with a vicious East wind blowing over the Spitzkoppe with temperatures of over 40 dec C, awful outside weather. We tried for a 1 night vacancy @ Desert Breeze on the off-chance of getting a room, we were received with real warmth by the lovely reception (Sunday Noon) and given a room looking over the dunes between Swakop /Walvis- this was by far the best accommodation in every respect of our 4 weeks in Namibia, the units are private and exceptionally well designed down to every detail, the interiors are modern but beautifully conceived, goes to show how the combination af a good architect and interior designer can multiply the enjoyments of the spaces (I too am an Architect) - Everything from the reception, the accommodation , the secure parking and the lovely breakfast must make this accommodation an absolute winner in Swakopmund. We will definitely visit again and recommend to friends. 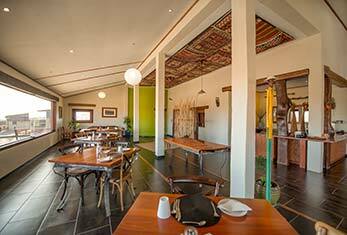 A unique lodge set on the banks of the Swakop river, with a beautiful view of the desert dunes. Fantastic accommodation, awesome breakfasts and very friendly and helpful staff. We really enjoyed our stay. This lodge is one of the best places in Namibia, the view is stunning, the rooms are great, the staff is very friendly and well organised, the manager is perfect and they have the best cappuccino over all. 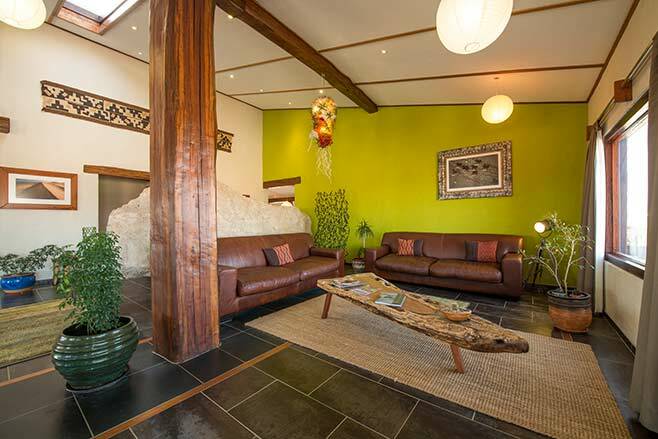 Please if you stay in Swakopmund stay at Desert Breeze. We flat out loved this place. Great views from the room/cottage of the dunes, wonderful spacious accommodation, delicious breakfast cooked perfectly. And the best part...happy, smiling, fabulous service. Certainly the best service we had during our three weeks in Namibia, hands down. It wasn't quite chilly enough to light our fireplace, but that would have been fun. Margaret, the manager, was very helpful and clearly on top of things and it showed. The owner also helped us sort out our tire problems ( which were fixed in town for free!). We were so delighted to be in a place where the individual tourist was recognized and respected, a very pleasant change. Another gem in Namibia. 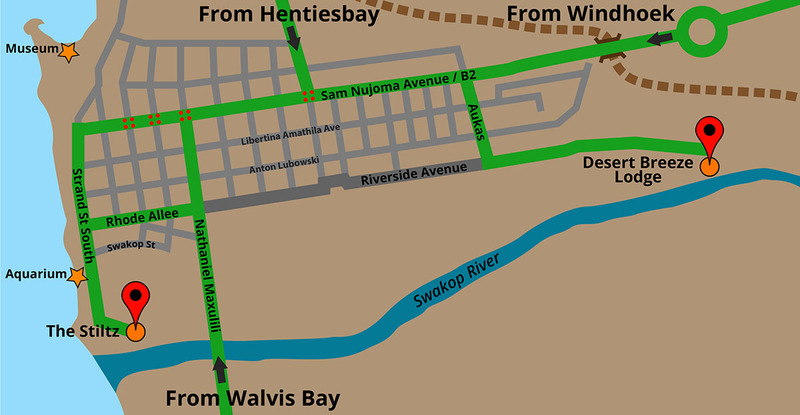 While just on the fringes of Swakopmund, it's an easy walk to downtown, and after sitting in a car for the best part of a week, it was good to stretch our legs. This is a lovely boutique hotel. 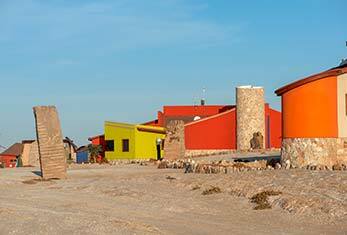 All the suites have sweeping views of the sand dunes, a beautiful, peaceful and tranquil vista. The shower in our room was just to die for; I could have stood under it for hours. And while we didn't light it, we loved the little log burner in our lounge. The staff are just brilliant too. Margaret and Andrea get special mentions for being super helpful, and we really enjoyed chatting with Dannie about all things Namibia. The restaurant staff are a fun bunch too - even in my bleary-eyed state getting up early for a trip to Walvis Bay I appreciated their cheery smiles and greetings. 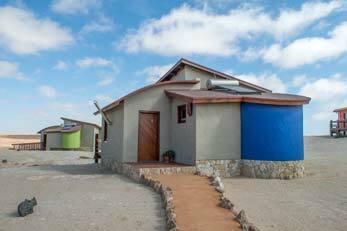 We'd definitely stay here again if we ever find ourselves in Swakopmund again, which hopefully one day we will.